Design is a relatively small part of the budget for Public-Private Partnership (P3) infrastructure projects, but when design is used strategically the impact can be catalytic. DIAC took up an invitation from the Urban Land Institute (ULI) to organize a tour and talk on the Eglinton Crosstown, as part of the Toronto Urbanism Symposium. In October 2018, the Institute for Competitiveness and Prosperity invited DIAC to develop and lead a Design Immersion tour as part of the TCI Network Global Conference in Toronto. The conference focused on best practices in the management of economic clusters. It gave DIAC the opportunity to showcase, to an international audience, some vital aspects of Toronto’s design cluster. It also provided a chance to assess the assets of design in the context of local priority clusters in the Toronto Region, including advanced manufacturing, food, financial services, transportation and logistics. As economic and social challenges escalate all over the world, we need to engage designers earlier and more deeply in macro innovation projects to create more human-centred, resilient and timely solutions to the global challenges of our time. DIAC participated in the ASID and IDC Impact Summit, May 8th and 9th 2017. What is the impact of industrial and graphic design in manufacturing in Canada? On February 19th at the Toronto Region Board of Trade, DIAC co-hosted a panel of visionary design leaders who explained why now is the perfect time for Toronto to invest in design. How can Main Street businesses access the latest digital technologies to improve business results? 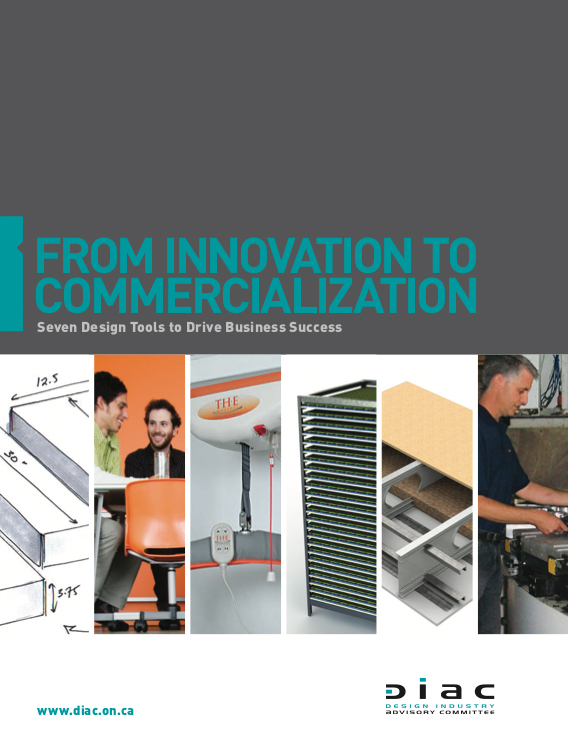 Design is the missing link in the product development process in Canada. In 2009 DIAC launched its Design Advisory Service. The program was supported by the National Research Council’s Industrial Research Assistance Program (IRAP). In 2007, the Design Industry Advisory Committee completed a research project for the Greater Toronto Marketing Alliance. In 2004, the Design Industry Advisory Committee developed a landmark study of design capability in Ontario that demonstrated that the Greater Toronto Region is a design hub for North America and the third largest centre for design employment (after New York and Boston).